Wrestling With Friends: I WATCHED AZTEC WARFARE. THIS IS WHAT I SAW. I WATCHED AZTEC WARFARE. THIS IS WHAT I SAW. It happened inside of a small warehouse, dubbed “The Temple”, in the working-class L.A. neighborhood of Boyle Heights. Gods, alive for centuries or perhaps millennia, fought amongst men, right here on planet Earth. And only a privileged few lay witness to it. The organization known as Lucha Underground ran its second-ever Aztec Warfare competition to crown a new champion this week. The battle, inspired by and created to honor Aztec gods and their descendants, was shrouded by a darker cloud this year. Just the week before, a terroristic regime that held control over the organization found itself crackling apart after its champion, a hulking mass of a man whose moniker, Mil Muertes, means “1,000 Deaths”, lost his title to the scrappy, populace-supported Fenix—a man who’s had enough resurrections from likely death to be considered the true-to-life bird from which he takes his name. Muertes, alongside his handler Catrina, decided to exploit what power they had left and turned the honorable Aztec Warfare contest into a brutal battle. Usurping the event wasn’t their only goal; they also had plans to turn Fenix’s reign into a fluke by placing him first in a field of 20 competitors to battle for the belt. Meanwhile, and very predictably, Muertes was given the opportune pick to come out last at number twenty. In between, 18 other competitors were invited to the fight. Though they all had sights on the gold, it was clear that Catrina and Muertes crafted this plan to weaken Fenix to the point that even he wouldn’t be able to rise from the ashes of war. While last year’s edition of Aztec Warfare could be seen as launching ground for a variety of new faces and feuds, this year’s was clearly going to be a place for many personal, heated battles to come to a head. Jack Evans, a cocky cruiserweight with the acrobatic athleticism to back it up, would spend most of his time with his head on a swivel, looking for the mystical Drago—the humanlike form of what some people believe to be an actual dragon—who had every right for revenge against Evans’ sneak attacks and even sneakier verbal barbs. Texano, a top-heavy cowboy dubbed the “Blue Collar Brawler” still hadn’t sunk his teeth far enough into Chavo Guerrero and his Crew, who’d dedicated most of their time to stripping the expert bull-roper of his honor and pride. The battle would also be the stage for some much-anticipated new faces to join the already stellar line-up of fighters. For the first time ever, El Dragon Azteca would grace the Temple with his presence. The mystery behind this man stretches back to last year’s Ultima Lucha competition, where it’s thought he took on the legacy of a legendary fighter, killed for breaking a long-standing treaty to stay away from the Temple. Azteca wasted no time in his campaign to push the Temple’s competitors, including former champion Prince Puma, to new limits, churning out moves never seen before in just his first few minutes of action. Then, of course, was the appearance of the legendary Rey Mysterio himself—the man for whom it could be said none of this would be possible. Not just the Temple, or Lucha Underground, but the overall thirst for thrilling, lucha-style wrestling and deeply-held mythologies that are respected even by the most villainous of women and men. Interest in the lucha style blossomed with Rey Mysterio in the last decade of the previous century, and even with the corporate atmosphere of professional wrestling threatening to kill these traditions, Mysterio fought in Aztec Warfare to an ovation that shows that his style is still very much alive and loved by the Temple’s Believers. The contest thus began, with Fenix and Mysterio showing each other, and the heritage of the Aztec people for whom they fought, a deep sign of respect—even with the dark shroud of Catrina and Mil Muertes hovering over it. The battle waged on, and each fighter came out one-by-one to add their own personal style and flair to the fight. Though it was an every-fighter-for-himself mentality, the personal battles eventually took center stage. The man with a movie star mentality, Johnny Mundo, continued his blood feud with Cage, a rock solid figure with steel for a skeleton. Drago duked it out with Evans and his nunchucking counterpart, the Darewolf PJ Black. However, it was perhaps the most intriguing and electric grudge that turned Aztec Warfare into something like ground zero of a nuclear zone; the feud between Mil Muertes and a man who hadn’t even been invited to the affair, Pentagon Jr.
Muertes, the clear favorite up to that point for having just held the title, and for his optimal placement in the order, wasn’t long for the contest once his rival appeared, steel chair in hand. It was more than a slight that Catrina barred Pentagon Jr. from the match—it was a rejection of his destiny. Muertes was quickly dispatched by Pentagon Jr. and his allies, and once the dust cleared it seemed like it was anyone’s championship to win. But of course, this is the sacred Temple, where nothing is ever as it seems. A timer began to count—commentator Matt Striker attributing it to a possible technical glitch—but we Believers, who knew the full story, knew the storm that was coming. We’ve watched the black clouds gather in the distance, some 300 miles away, where the previous trustee of the Temple, Dario Cueto, started hatching plans for his return. A war was started when the original El Dragon Azteca was killed in cold blood at last year’s Ultima Lucha, breaking a truce between Azteca and Cueto’s families. And while we saw the legacy of Azteca return already this night, Cueto had a Weapon X of his own—his monster, his hermano, Matanza. Up until this evening, all we knew of Matanza was that he only spoke in grunts and had an appetite for human flesh and blood, routinely quelled by his brother Dario. Weeks passed and layers were peeled, and soon we found the true reason for Dario’s affection for his inhuman monster of a brother—he’d saved Dario’s life from the hands of their equally monstrous mother. The timer ticked down to zero. 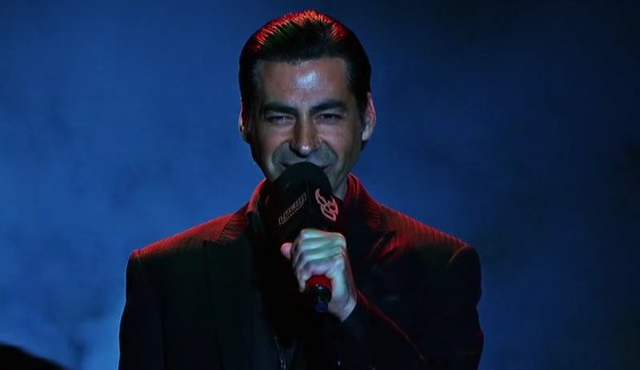 Though we saw it coming, we were all still shocked by the reappearance of Dario Cueto in his Temple—a surreal sight if there was one—though perhaps no one was as shocked as Catrina, who had been doing everything in her power to wrestle her disintegrating control back from the likes of Pentagon Jr. and his maestro, Vampiro. She was banished in short order by Cueto—but this was not his only pronouncement. Instead, we’d find out that there was a 21st contestant in Aztec Warfare—the beast himself, Matanza. Days, weeks and months led up to this moment, and it wasn’t long before Matanza single-handedly stole the Temple back for his brother. Fighter after fighter was simply destroyed. Power moves that they may have kicked out of in a more spirited match left them on the mat for the three count—a survival technique more than an actual loss. Men who thought they’d outsmarted Aztec Warfare rules, and the gods who inspired them—men like Joey Ryan—are victimized by Matanza. Ryan, in particular, had handcuffed himself to a steel post to avoid pinfall, yet perhaps by surprise to no one, steel is no match for Matanza. He broke Ryan free and did away with him in quick form. Believers in the Temple pled with the fighters to band together and stop the monster. But this was no ordinary opponent. This was Matanza: a collection of evil components so destructive, it led one to think that if gods did exist, they were nowhere in sight on this evening. One of the fighters, Chavo Guerrero (a last name synonymous in wrestling with finding the easiest way out) tried out his wiles by attempting to collude with the Cueto brothers. A temporary truce was created, but lasted only seconds as Dario, almost unseen in the shadows, drew a line across his throat, approving Matanza’s dismantling of the deceived Guerrero. Before long, only two fighters remained to take on Matanza. El Dragon Azteca had fallen. The champion, Fenix, was been driven back down into the depths of some Purgatory-like realm, losing his short-lived championship along the way. The only hopes for the Believers, and the Temple, were the valiant, former champion Prince Puma, who called Boyle Heights home, and Rey Mysterio, the man who, perhaps unintentionally, opened the doors for the Cueto brotherhood to rise to power in the first place. And so it was Rey who was last to do battle with Matanza, once Puma, a man who’d fought out of every move in the luchador handbook, fell in surprisingly short fashion. Mysterio, through experience and a youthful fighting spirit, put in the most offense against Matanza. But what hope did Mysterio truly have if even the descendants of Aztec gods couldn’t vanquish the monster? Mysterio soon fell; Matanza’s final victim betwixt himself and the championship that his brother Dario, recklessly and thoughtlessly, freed him to win. The Temple is now back in the hands of Dario Cueto, like it had been when we Believers first sought out on this journey. However, there’s something more completely sinister, more disarming, in this second reign than existed in the first, and it goes by one name: Matanza. He holds the championship. He now lays claim to Mil Muertes’ throne of skulls. And, somehow unbelievably, we already know his reign will be 1,000 times darker than that of Catrina and Muertes. We are Believers. And now we must empower that name by believing that the Cueto brotherhood can be destroyed. Through countless legends, ancient and otherwise, we’re told that good always conquers evil. There’s always a crack in the foundation to exploit. Right now, that crack, if there is one, is so imperceptible that even the gods must be confounded. Matanza cannot be hurt. Dario cannot be outsmarted. If a man or god exists that can defeat Matanza, we do not yet know him. For after what we saw at Aztec Warfare, it’s clear that the Temple, and the Believers, have now been transported to some infernal ring of hell; the one furthest from the reaches of the most powerful of heroes.